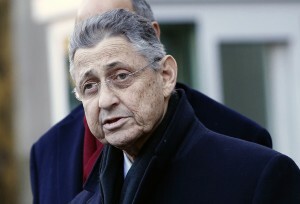 NEW YORK — Former New York State Assembly Speaker Sheldon Silver was indicted Thursday on three charges after his arrest in a federal bribery case. The indictment doesn’t add to the charges against Silver when he was arrested, but it’s a critical step that provides a legal roadmap for prosecutors’ presentation of evidence. Silver will now have to enter a plea, at a date yet to be set, to charges that include two forms of honest services fraud, plus extortion under the color of official duties. “Our client is not guilty. We can now begin to fight for his total vindication. We intend to do that fighting where it should be done — in court,” Silver’s lawyers, Joel Cohen and Steve Molo, said in a statement. Silver has said he is confident he will be exonerated. Silver’s arrest came after he had led the Assembly for over 20 years, becoming one of the most powerful and savvy figures in New York state politics. But prosecutors said there was a dark side to his reputation as a potent backroom operator who played a major role in state budgets and laws, controlling which lawmakers sat on which committees and what bills got a vote. The government said he had collected nearly $4 million in bribes and kickbacks since 2002 and disguised the proceeds as legitimate income. The Democrat has since resigned as speaker but has said he intends to keep his Assembly seat. Silver’s arrest rocked the state Capitol, even though state lawmakers’ arrests have become ruefully common. Some 28 New York legislators have stepped down because of criminal or ethical issues in the past 15 years. Four others remain in office while they fight charges, including Silver. He was particularly critical of what he called a “three-men-in-a-room” system of government that puts too much control in the hands of the governor, Assembly speaker and Senate president.